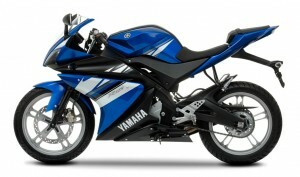 Yamaha just announced the updated model of the YZF-R125 for the European market. The R125 is a 125cc bike from Yamaha that is hugely popular abroad. The new Yamaha R125 is powered by a liquid-cooled 124.7 cc engine that produces 15 hp at 9,000 rpm and peak torque of 12.4 Nm at 8,000 rpm. The bike is built on a steel deltabox frame and gets reworked inverted front fork with new ultra-rigid triple clamps for the front suspension and redesigned rods for the linked monoshock with preloaded spring adjustment at the rear. The air intake positioned between the two head lights on the front dome has been adopted from the R6 design and overall size of the bike has also been changed a bit. The new R125 is having 1955 mm length, 680 mm width and 1065 mm height as standard and the wheel base of the model is 1355 mm. The overall weight of the bike is around 140 kilograms and the fuel tank capacity of the model is 11.5 litres. Both the wheels gets floating disc brakes Yamaha has used forged aluminium for making brake pedal. As per the information, the new R125 is around 11% more fuel efficient than the former edition.